It’s been a few weeks since Superior Pastry has begun, and I’ve definitely taken to the slow pace of having my classes spread out over 2.5 months. I’ve been strolling the streets of Paris, running once in a while (and consequently screwing up my IT band so that’s on hiatus), and hanging out in cafés with old friends back in Paris for the new school year. We kicked off the first class of the year making a very traditional French dessert, the Baba au Rhum. 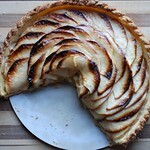 Although a staple in all patisseries, it’s not really my cup of tea. I had never tried one until we made it in school, and I am glad I saved my euros for macarons instead! 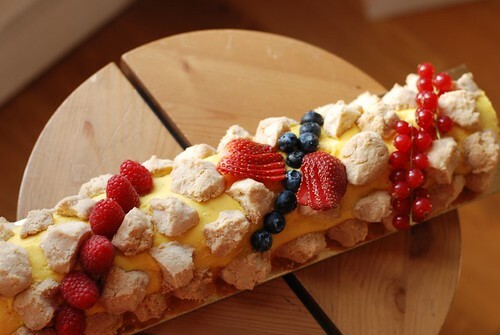 It’s a bread-like cake soaked in rum and fruit flavoured syrup. The syrup is meant to saturate the cake so that minimal chewing is required. 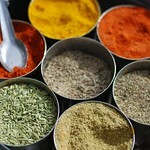 In fact, that’s why the Baba was invented. 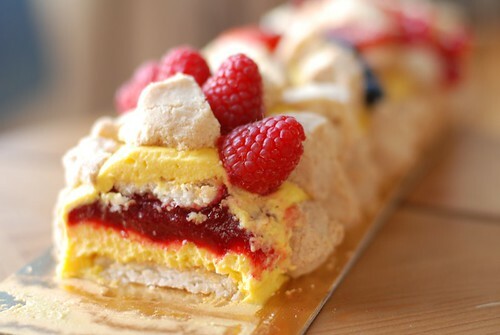 It was invented by Nicolas Stohrer of the Stohrer Patisserie on Rue Montorgueil, for the Duke of Lorraine. The Duke was old and unable to chew, so this dessert was created for him. Yikes. 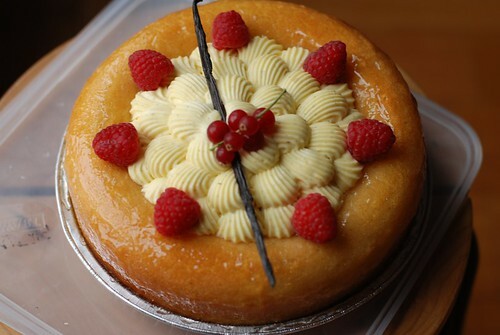 I actually forgot to put in the rum in the end, so my cake was just soaked in a citrus syrup…I still didn’t like it much. 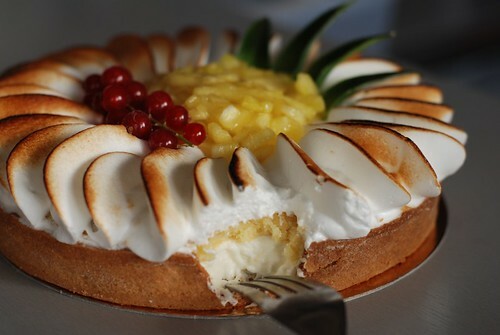 Then we moved on to the Tarte Creole – named so because it is filled with coconut mousse and lined with a crumbly cake layer before a tropical fruit feast descends on the Italian meringue topping. 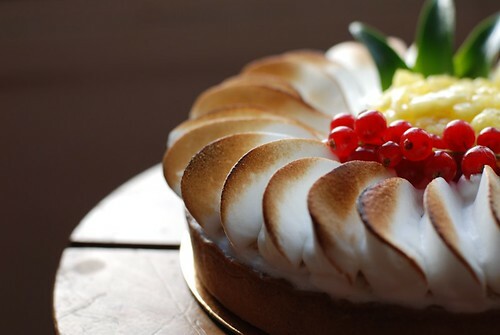 I really looked forward to making this tart because I had seen this type of piping on top of lemon meringue tarts everywhere in Paris, and had wanted to give it a try. I think I did alright. As long as I wasn’t thinking about it too much, the piping came out fine. As soon as I paused to contemplate my next steps a bit more, I got a little wobbly and made slightly uneven patterns. 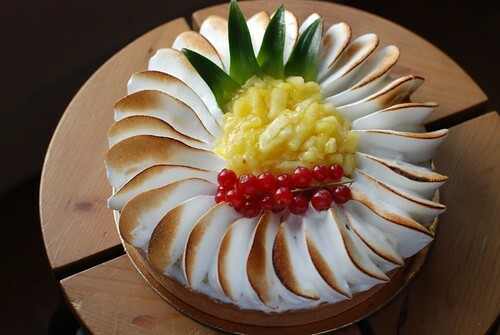 In Superior Pastry, we are combining all of our previous knowledge on making mousseline creams, buttercreams, meringue, mousse, etc. and making fancy cakes, and we spent a couple of classes assembling some serious high-maintenance desserts. 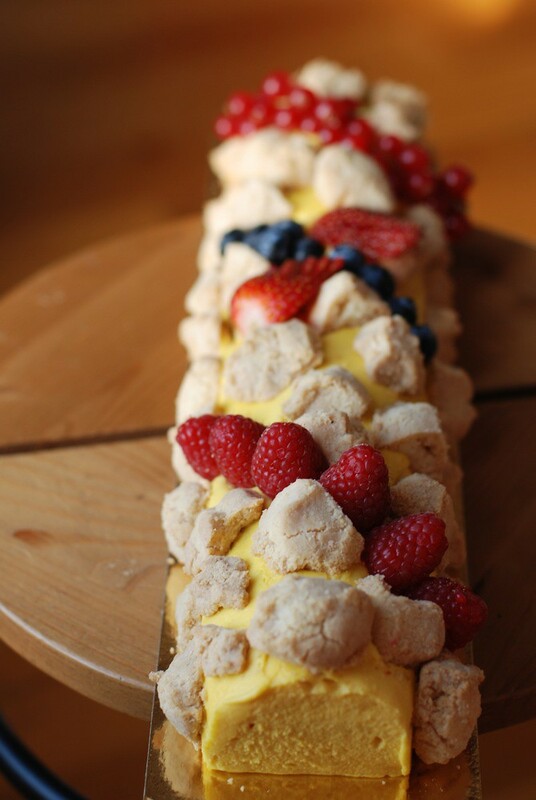 Although a little bit late to the Christmas yule log scene, we made a super summer-y yule log consisting of a light dacquoise cake, mango mousseline cream, and a soft raspberry filling. The top was decked out with crumbly cookies, giving the whole cake a really interesting texture. In demonstration the chef assembled a few variations in traditional round ring molds to make these into cakes, which I thought looked pretty good too. 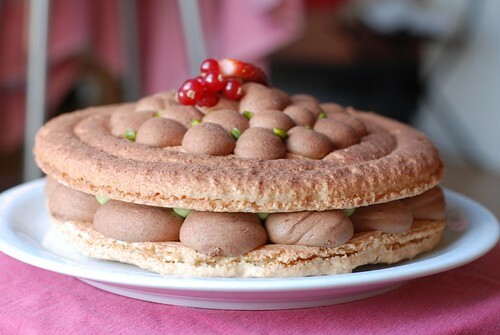 Lastly, we made a giant macaron cake. The shell was very much like a macaron, and the inside was filled with one of the most delicious chocolate mousses we’ve made to date, and a creamy pistachio filling. I don’t normally like pistachio flavoured desserts, but this one was so yummy that I devoured my sample piece in demonstration. The macaron shell was crunchy on the outside and chewy on the inside, and the chocolate and pistachio worked really well together. Except…I forgot how rich these desserts could be and how I’m no longer a really big fan of chocolate mousse. 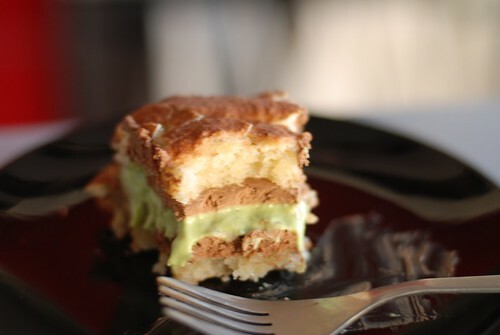 I attempted to have myself a nice slice of cake on the weekend, and before I could even finish my slice, I was feeling queasy from all that chocolate and pistachio cream. This cake had an unfortunate ending in the garbage, but I’d definitely make it again to share with friends! We move on to little restaurant desserts soon, so stay tuned for some fun unconventional desserts! 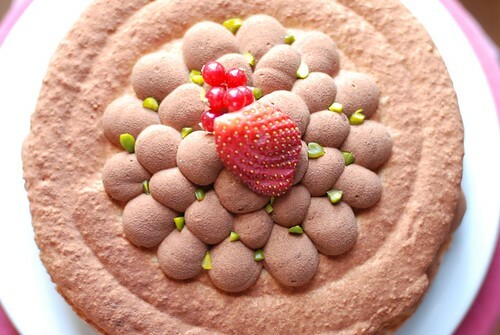 drool….the chocolate and pistachio one looks amazing!